The launch of the bar was set to coincide with the release of the much-anticipated fifth instalment of the Pirates of the Caribbean franchise, Dead Men Tell No Tales. The bar itself was to feature Caribbean cocktails from in-house mixologists Turtle Bay, pirate props and a steel band playing everything from Caribbean calypso to traditional sea shanties. Our response was simple: create an engaging and humorous video. 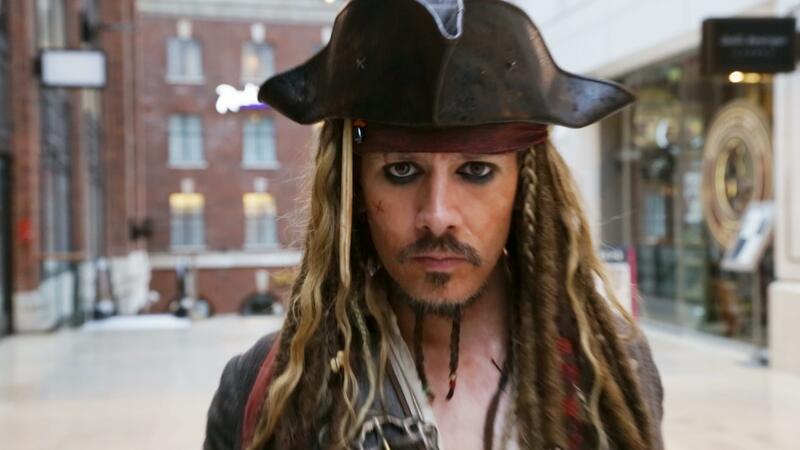 In order to encourage excitement and buzz around the bar and drive footfall to its launch, we called on ultimate Jack Sparrow lookalike, Simon Newton, to create (a lot of) mischief in and around Leeds city centre on one particularly gloomy Monday evening. Our strategy was to release three micro videos over the weekend, teasing the people of Leeds about what was to come, and one full length video afterwards, driving people to the bar’s opening on May 26th. The results were incredible, with the video achieving a reach of almost half a million people, all in Leeds, drove 128,000 video views and encouraged a total of 13,000 likes, comments and shares. Did you see the video? We’d love to hear your thoughts. Check it out here.